For cars of each train, glue end of 1 ribbon onto wide side of 1 gum package, 1 raisin package, 2 more gum packages and 1 more raisin package, spacing cars about 1/2 inch apart. 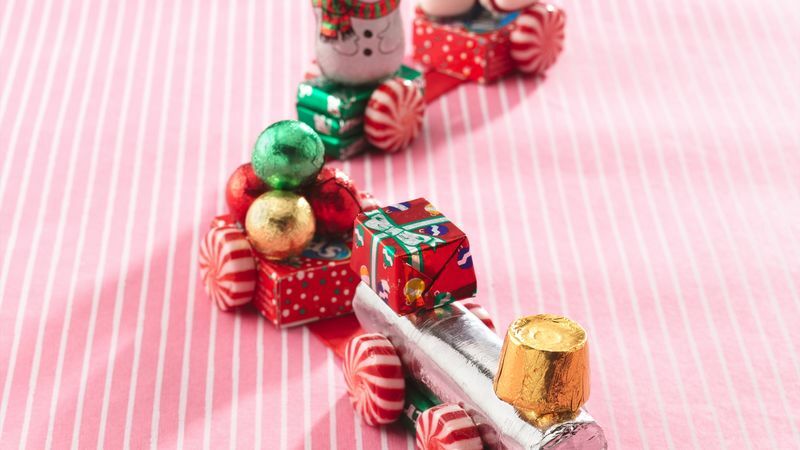 For wheels, glue 4 peppermint candies onto sides of gum packages and 2 candies onto sides of raisin packages. For engine, glue roll of ring-shaped candies onto first ribbon-topped gum package. Glue 2 foil-wrapped milk chocolate candies onto top of engine. Glue additional candies, candy canes and raisin packages to train cars as shown in photo or as desired. Repeat to make remaining 3 trains. Clear tape can be used instead of glue. Browse a candy store to discover new gems to use when making trains.